We had the pleasure of spending an afternoon with Peter Kamau, a 28-year old business entrepreneur from Kambaa, Kenya. Peter is the first dairy trader to partner with LishaBora and pioneer the use of our business management mobile application to grow his business. 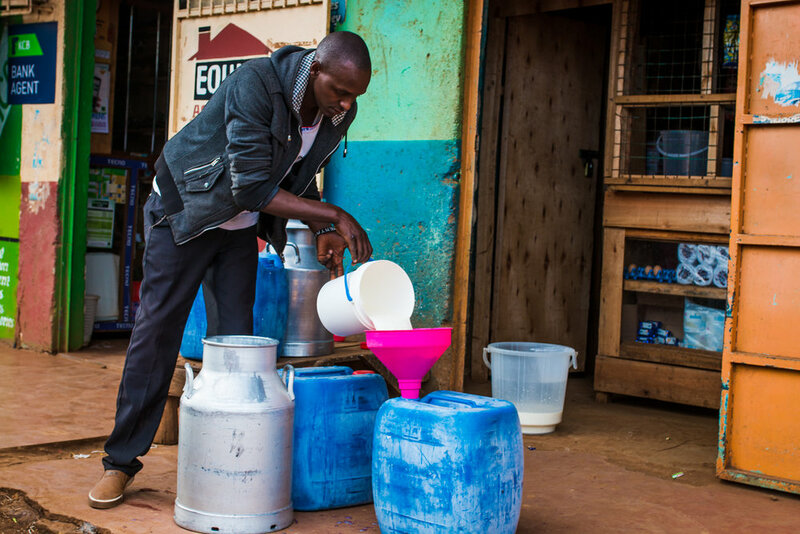 Peter is an incredibly busy man with his network of 55 farmers whom he collects milk from twice per day in addition to running his own duka (small shop) in the town of Kambaa. 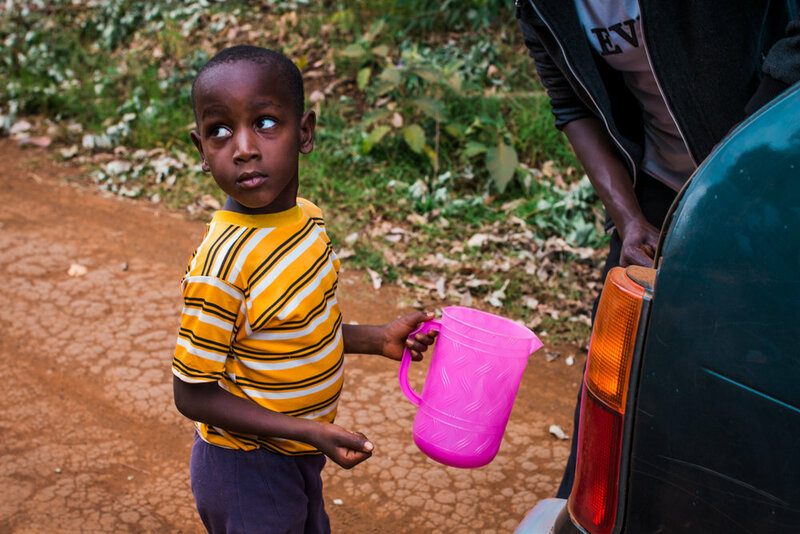 We were honored that he allowed us to join him on one of his afternoon milk collection runs so that we could hear his insights on the dairy industry in Kenya. LB: What were you doing before you started your own business? Peter: I was working for a large company driving pickup trucks, delivering freshly picked tea leaves from the many tea plantations around Kambaa to the processing facilities. The owner of this business treated his employees with little respect and finally, I couldn't take it anymore so I quit. The next couple months were difficult as employment opportunities in Kenya are hard to find, I spent 2 months at home figuring out what to do next. LB: What inspired you to get into the dairy trading business? Peter: I saw a lot of dairy farmers along the routes I was driving with my pickup truck. I knew a lot of farmers in Kenya end up selling their milk to large corporations in the formal sector like Fresha, but there was no Fresha drop off point near farmers in Kagaa [village north of Kambaa] so they were forced to travel large distances, resulting in lower net profits. There was a deficit of milk products in Kambaa because farmers had no collection point to sell to. Chai [tea] with maziwa [milk] is a popular drink in Kenya and the hotels [restaurants] were dry! This is what motivated me to start my own dairy trading business. I realized that if the farmers had someone in the community they could sell to, it would provide them easier access to market and more income opportunities for all. LB: What did the early days of your business look like? Peter: I started out collecting milk on an old motorbike, which was very problematic. With heavy rains, you risk falling down and spilling your milk and losing the profits of that day. The dairy sector in Kenya is very trust-based, and in the beginning it was hard to convince farmers to sell their milk to me as they didn’t know me well. I was blessed when Esther trusted me enough to become my first customer. For the first month, she was my only customer, producing 6L/day which was not sufficient to cover my own transportation costs. 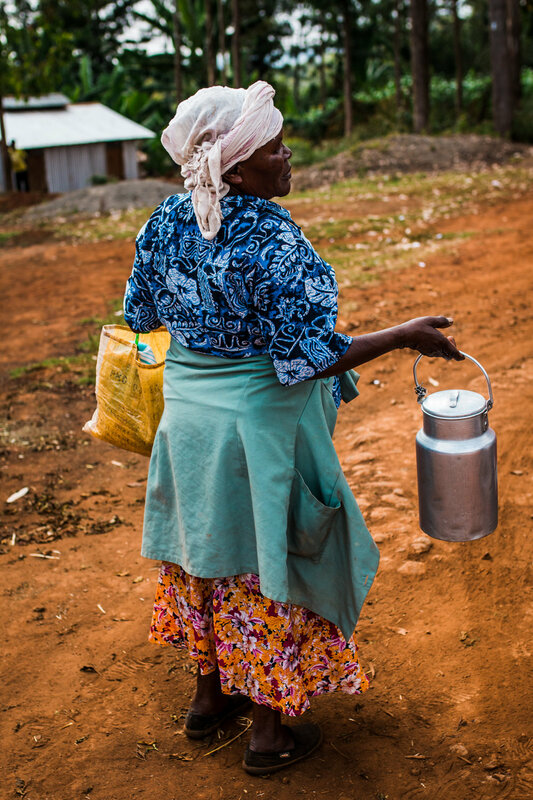 We worked together to increase her milk profits by using the right feeds - like LishaBora's Jawabu Dairy Meal - and keeping her cow healthy, so eventually her production increased to 11L per day! As things were improving for her, neighbours started to inquire who she was selling her milk to. My business began to grow as word was spread amongst neighbours in the community. LB: What does your business look like today? Peter: After 2 years of continually depositing my earnings into a bank account, I became qualified to receive a financial loan, which allowed me to purchase a car, and made my transportation route more reliable. I was financially able to hire an assistant to do pickups with me, decreasing the total time spent at each collection point and increasing the number of customers I could serve every day. Today, I have 55 smallholder farmers whom I collect milk from twice per day. The morning pick-up begins at 4:30AM, and the afternoon pick-up begins at 2PM, lasting about 3 hours each. In between pick-ups I manage my duka [small shop] in Kambaa where I sell a variety of items including milk. I’m currently collecting around 390L of milk/day and selling each L for 50 KSH. LB: How has LishaBora’s business management mobile application helped grow your business? Peter: With the LishaBora app I no longer need to manually add up my daily milk collections, leaving more time at the end of the day for other activities like expanding my network of smallholder farmers to increase my profits. The less time I spend on documentation, the more time I have to grow my business. By keeping precise track of the credit and loans I give out to farmers, I have real understanding of my financial situation. Since the app keeps a historical record of all my collections, I can plan better for my finances and for my future. LB: What do you see as the biggest challenge that dairy Traders in the informal market face in Kenya? Peter: The best market for selling milk is in Nairobi city, but the Dairy Cooperatives have monopolized the sector, making it difficult for micro-entrepreneurs like myself to enter this market and sell our milk. In order to sell the milk on the formal market, I require a license but it is expensive and disproportionate to my earnings. My license would cost the same as the license acquired by a large corporation like Fresha! I don’t have access to processing or chilling facilities, which makes my product unsuitable for formal market standards. If I could sell on the formal market, I could increase my net earnings since I could sell the milk for 80 KSH/L. LB: What is your future plan for your business as a dairy Trader? Peter: My vision is to become a large scale dairy producer, where I would sell milk and other products like cheese and yogurt. I wish to grow to the size of Fresha but continue servicing the informal sector and communities like my own in Kambaa. The next step for me is to get certified by the Kenyan Dairy Board. In order to do this I need to reach a point where I can afford to purchase a Dairy Trading license. With the LishaBora app reducing my time on manual tasks, I will be able to allocate more time on growing my network to form connections I need to sell my community’s milk in the formal market and receive more earnings for smallholder farmers and myself. Young entrepreneurs like Peter Kamau are exactly what motivates LishaBora to continue its mission of improving the profitability, scalability and sustainability for the informal dairy sector in Kenya. Many unemployed youth in Kenya can be inspired by Peter’s story and look at starting their own trading business in dairy and beyond. By implementing the LishaBora application into their daily work, they can greatly increase their efficiency and thereby spend time on the things that can actually help grow their business. Takeaway #1: The social enterprise startup scene is burgeoning in Nairobi and young entrepreneurs are excited to use technology like mobile applications to improve their efficiency as they reduce the time spent on repetitive, manual and erroneous tasks and free up time for innovative thinking. Takeaway #2: With the growth and success of LishaBora, increased potential such as opportunity for Traders to be licensed under a future LishaBora cooperative could become a reality. This would open up the network of market opportunities available to smallholder Farmers and dairy Traders in rural Kenya thereby increasing their profits and providing more stable income for their families. Takeaway #3: LishaBora’s business management mobile application develops credit history for both dairy Traders and Farmers, thereby opening up all the doors of opportunities that come with access to a loan from a financial institution. Peter in his element, doing what he loves most. LishaBora’s missions is to improve the profitability, scalability and sustainability of smallholder dairy Farming in Kenya. Now that you have some insight into the informal dairy Trading business of Kenya, we want to hear from you! What do you think could help entrepreneurs like Peter Kamau grow their business? Leave your comment on our blog post below!